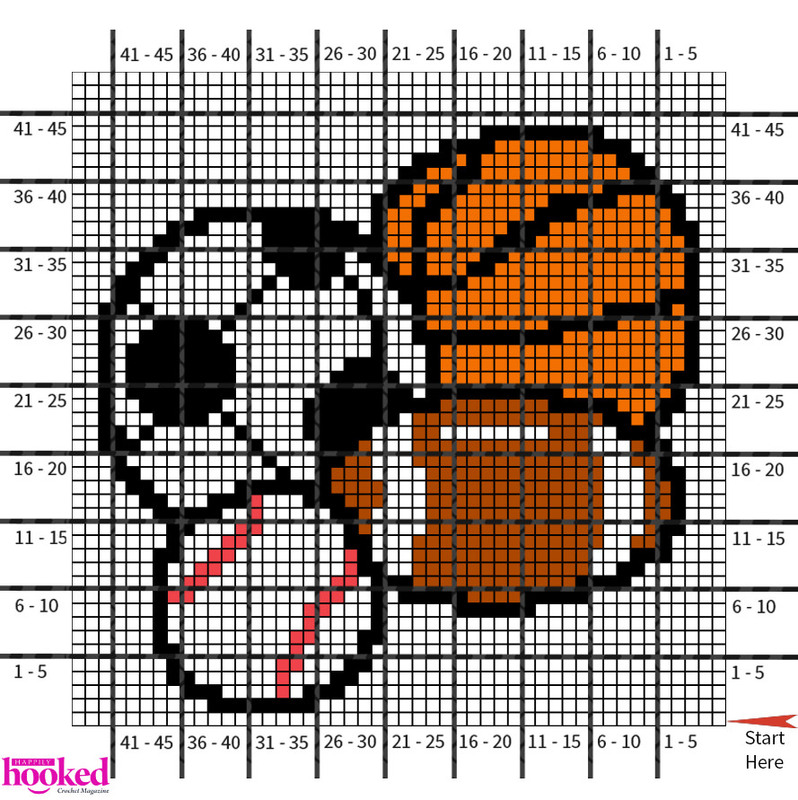 Big Boy Blanket – #2 Sports! We hope you enjoyed the first pattern of our Big Boy Blanket! If you missed it, you can find it here. 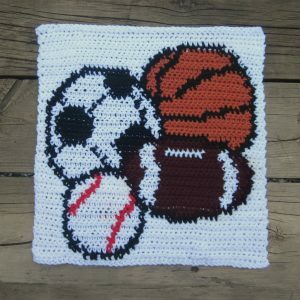 Our second square of the Big Boy Blanket is something that my 16-year-old still loves: sports! From basketball to football to soccer, boys have a fascination with throwing, kicking, hitting, and bouncing balls of all shapes and sizes. Yarn: Worsted weight yarn: 1 skein each of White (A), Brown (B), Orange (C), Red (D), Black (E). Row 1: With A, sc 48. Row 2: With A, sc 10. With E, sc 8. With A, sc 30. Row 3: With A, sc 28. With E, sc 3. With A, sc 1. With D, sc 1. With A, sc 4. With E, sc 3. With A, sc 8. Row 4: With A, sc 7. With E, sc 2. With A, sc 6. With D, sc 1. With A, sc 3. With E, sc 2. With A, sc 27. Row 5: With A, sc 26. With E, sc 2. With A, sc 3. With D, sc 2. With A, sc 7. With E, sc 1. With A, sc 7. Row 6: With A, sc 6. With E, sc 2. With A, sc 8. With D, sc 1. With A, sc 4. With E, sc 1. With A, sc 26. Row 7: With A, sc 25. With E, sc 2. With A, sc 3. With D, sc 2. With A, sc 9. With E, sc 1. With A, sc 6. Row 8: With A, sc 6. With E, sc 1. With A, sc 10. With D, sc 1. With A, sc 4. With E, sc 1. With A, sc 25. Row 9: With A, sc 14. With E, sc 6. With A, sc 5. With E, sc 1. With A, sc 3. With D, sc 2. With A, sc 10. With E, sc 1. With A, sc 6. Row 10: With A, sc 6. With E, sc 1. With D, sc 2. With A, sc 9. With D, sc 2. With A, sc 2. With E, sc 1. With A, sc 1. With E, sc 5. With B, sc 4. With E, sc 5. With A, sc 10. Row 11: With A, sc 7. With E, sc 4. With B, sc 12. With E, sc 3. With A, sc 1. With D, sc 2. With A, sc 9. With D, sc 2. With A, sc 1. With E, sc 1. With A, sc 6. Row 12: With A, sc 6. With E, sc 1. With A, sc 2. With D, sc 2. With A, sc 9. With D, sc 1. With E, sc 2. With A, sc 2. With B, sc 13. With A, sc 2. With E, sc 2. With A, sc 6. Row 13: With A, sc 4. With E, sc 3. With A, sc 3. With B, sc 13. With A, sc 3. With E, sc 1. With D, sc 1. With A, sc 8. With D, sc 2. With A, sc 2. With E, sc 2. With A, sc 6. Row 14: With A, sc 7. With E, sc 1. With A, sc 3. With D, sc 2. With A, sc 7. With E, sc 2. With A, sc 3. With B, sc 14. With A, sc 2. With B, sc 2. With E, sc 1. With A, sc 4. Row 15: With A, sc 3. With E, sc 2. With B, sc 1. With A, sc 3. With B, sc 13. With A, sc 4. With B, sc 1. With E, sc 1. With A, sc 6. With D, sc 2. With A, sc 3. With E, sc 2. With A, sc 7. Row 16: With A, sc 6. With E, sc 5. With A, sc 2. With D, sc 1. With A, sc 5. With E, sc 2. With B, sc 1. With A, sc 4. With B, sc 13. With A, sc 3. With B, sc 2. With E, sc 1. With A, sc 3. Row 17: With A, sc 3. With E, sc 1. With B, sc 2. With A, sc 3. With B, sc 13. With A, sc 3. With B, sc 3. With E, sc 3. With A, sc 3. With D, sc 1. With E, sc 3. With A, sc 3. With E, sc 2. With A, sc 5. Row 18: With A, sc 4. With E, sc 2. With A, sc 6. With E, sc 7. With B, sc 4. With A, sc 3. With B, sc 13. With A, sc 3. With B, sc 2. With E, sc 1. With A, sc 3. Row 19: With A, sc 3. With E, sc 2. With B, sc 1. With A, sc 3. With B, sc 13. With A, sc 4. With B, sc 3. With E, sc 1. With A, sc 2. With E, sc 1. With A, sc 10. With E, sc 2. With A, sc 3. Row 20: With A, sc 3. With E, sc 1. With A, sc 10. With E, sc 1. With A, sc 3. With E, sc 2. With B, sc 2. With A, sc 3. With B, sc 14. With A, sc 2. With B, sc 2. With E, sc 1. With A, sc 4. Row 21: With A, sc 4. With E, sc 2. With B, sc 1. With A, sc 3. With B, sc 13. With A, sc 3. With B, sc 1. With E, sc 3. With A, sc 4. With E, sc 1. With A, sc 8. With E, sc 3. With A, sc 2. Row 22: With A, sc 2. With E, sc 2. With A, sc 1. With E, sc 1. With A, sc 6. With E, sc 1. With A, sc 4. With E, sc 5. With A, sc 3. With B, sc 2. With A, sc 8. With B, sc 3. With A, sc 2. With E, sc 3. With A, sc 5. Row 23: With A, sc 4. With E, sc 2. With C, sc 1. With E, sc 2. With B, sc 14. With A, sc 1. With E, sc 7. With A, sc 5. With E, sc 1. With A, sc 1. With E, sc 4. With A, sc 3. With E, sc 1. With A, sc 2. Row 24: With A, sc 2. With E, sc 1. With A, sc 2. With E, sc 6. With A, sc 6. With E, sc 10. With B, sc 8. With E, sc 5. With C, sc 3. With E, sc 2. With A, sc 3. Row 25: With A, sc 3. With E, sc 1. With C, sc 8. With E, sc 10. With A, sc 1. With E, sc 7. With A, sc 6. With E, sc 8. With A, sc 1. With E, sc 1. With A, sc 2. Row 26: With A, sc 2. With E, sc 1. With A, sc 1. With E, sc 8. With A, sc 7. With E, sc 5. With A, sc 2. With E, sc 1. With C, sc 17. With E, sc 2. With A, sc 2. Row 27: With A, sc 2. With E, sc 1. With C, sc 18. With E, sc 1. With A, sc 3. With E, sc 3. With A, sc 8. With E, sc 8. With A, sc 1. With E, sc 1. With A, sc 2. Row 28: With A, sc 2. With E, sc 1. With A, sc 1. With E, sc 8. With A, sc 10. With E, sc 1. With A, sc 3. With E, sc 1. With C, sc 18. With E, sc 1. With A, sc 2. Row 29: With A, sc 2. With E, sc 1. With C, sc 9. With E, sc 11. With A, sc 2. With E, sc 1. With A, sc 11. With E, sc 6. With A, sc 2. With E, sc 1. With A, sc 2. Row 30: With A, sc 2. With E, sc 1. With A, sc 3. With E, sc 4. With A, sc 1. With E, sc 1. With A, sc 10. With E, sc 1. With A, sc 2. With E, sc 1. With C, sc 9. With E, sc 5. With C, sc 5. With E, sc 1. With A, sc 2. Row 31: With A, sc 2. With E, sc 1. With C, sc 1. With E, sc 5. With C, sc 13. With E, sc 1. With A, sc 3. With E, sc 1. With A, sc 8. With E, sc 1. With A, sc 6. With E, sc 1. With A, sc 1. With E, sc 2. With A, sc 2. Row 32: With A, sc 3. With E, sc 2. With A, sc 8. With E, sc 1. With A, sc 7. With E, sc 1. With A, sc 2. With E, sc 2. With C, sc 17. With E, sc 3. With A, sc 2. Row 33: With A, sc 2. With E, sc 1. With C, sc 16. With E, sc 6. With A, sc 2. With E, sc 1. With A, sc 1. With E, sc 3. With A, sc 1. With E, sc 1. With A, sc 9. With E, sc 2. With A, sc 3. Row 34: With A, sc 4. With E, sc 2. With A, sc 9. With E, sc 5. With A, sc 2. With E, sc 2. With C, sc 1. With E, sc 1. With C, sc 3. With E, sc 2. With C, sc 14. With E, sc 1. With A, sc 2. Row 35: With A, sc 2. With E, sc 1. With C, sc 13. With E, sc 2. With C, sc 4. With E, sc 1. With C, sc 2. With E, sc 2. With A, sc 1. With E, sc 6. With A, sc 7. With E, sc 2. With A, sc 5. Row 36: With A, sc 6. With E, sc 2. With A, sc 6. With E, sc 9. With C, sc 2. With E, sc 1. With C, sc 5. With E, sc 3. With C, sc 11. With E, sc 1. With A, sc 2. Row 37: With A, sc 2. With E, sc 2. With C, sc 9. With E, sc 3. With C, sc 6. With E, sc 1. With C, sc 2. With E, sc 1. With A, sc 1. With E, sc 7. With A, sc 4. With E, sc 3. With A, sc 7. Row 38: With A, sc 9. With E, sc 10. With A, sc 3. With E, sc 1. With C, sc 2. With E, sc 2. With C, sc 7. With E, sc 3. With C, sc 7. With E, sc 1. With A, sc 3. Row 39: With A, sc 3. With E, sc 2. With C, sc 3. With E, sc 5. With C, sc 7. With E, sc 2. With C, sc 2. With E, sc 2. With A, sc 22. Row 40: With A, sc 23. With E, sc 2. With C, sc 2. With E, sc 2. With C, sc 10. With E, sc 5. With A, sc 4. Row 41: With A, sc 5. With E, sc 2. With C, sc 11. With E, sc 2. With C, sc 2. With E, sc 2. With A, sc 24. Row 42: With A, sc 25. With E, sc 3. With C, sc 1. With E, sc 1. With C, sc 10. With E, sc 2. With A, sc 6. Row 43: With A, sc 7. With E, sc 3. With C, sc 7. With E, sc 4. With A, sc 27. Row 44: With A, sc 30. With E, sc 9. With A, sc 9.